What's read all over? Ireland! 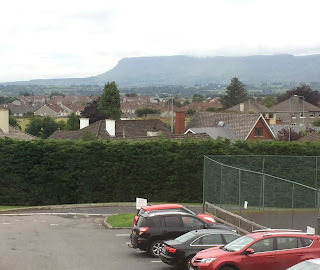 Here's the view out our window from the Sligo Park Hotel. Yep, good old Ben Bulben out past the car park. 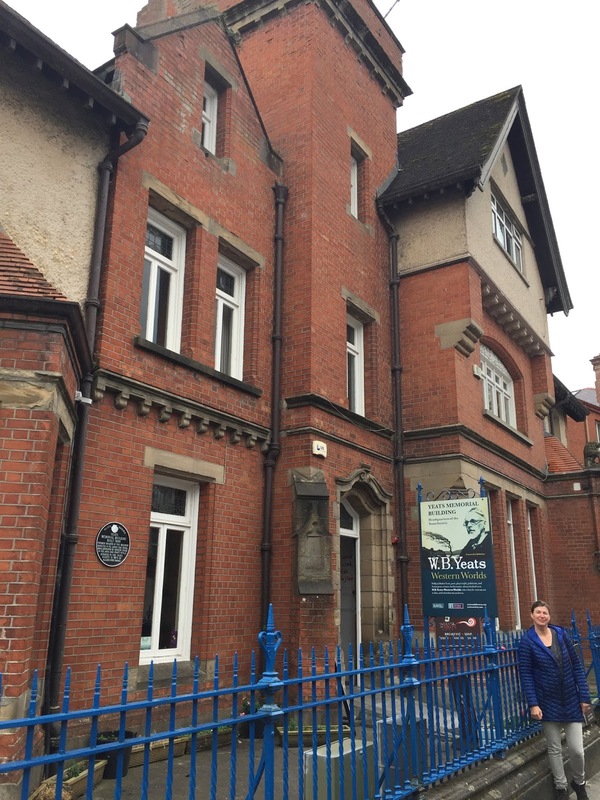 Turns out it would be yet even more of Yeats day than we imagined, as we'll get to in Toured. 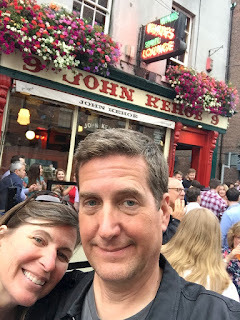 Then we do have one more night in Dublin, since we flew out early the next day--that meant we could drop off the rental car this day, walk about, and just taxi to the airport. While our first place was right in town on the Liffey, this time the Air BnB was in the more suburban-feeling Portobello, in an apartment in the land of rowhouses--it felt very Baltimore or Brooklyn. There was laundry. It was a bit quirky--the living room, of all things, was dominated by a painting of New York City (where we were headed next--I wonder if they do that for all their guests? ), but for a night it was perfect. One last hotel breakfast buffet--you do a few of these and you wonder if there's just one central kitchen that caters them all. 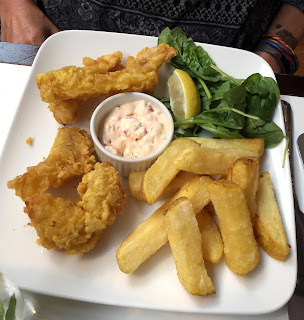 Quite pleasant, certainly filling, but nothing to blog home about. 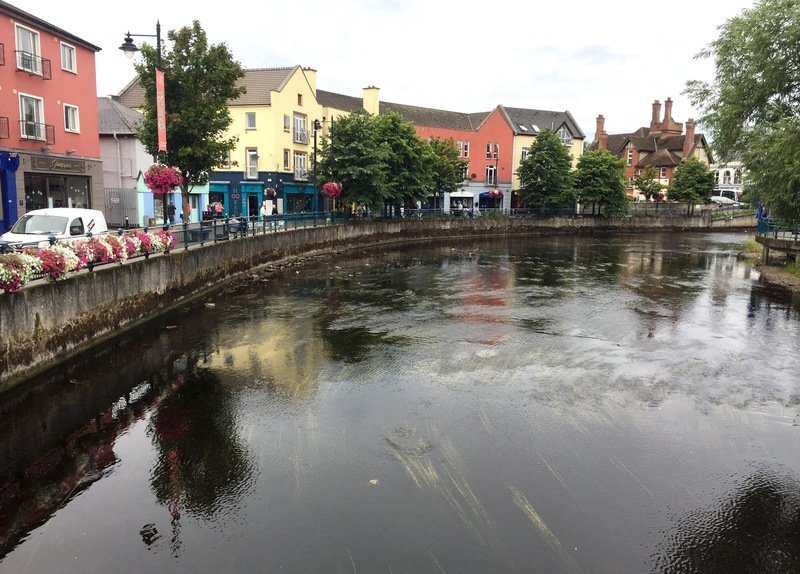 As we did so well while traveling, we sort of were preoccupied through the lunch hour (and more), as we had to make the drive from Sligo to Dublin, drop off our suitcases at the Air BnB, then drive to the north side of Dublin to drop off the car. Then, us being us, we walked back from there to the heart of things. But sneaky Chryss had led a thought since we left Dublin, and it was this: Pieman. It's very hard to take pictures of walk-away food as your hands have better things to do--stuff your face--than click away. But Chryss had a veg and I had to have a steak and stout, as that seemed only appropriate if I was only going to have one--start with the traditions, then try other things. (It's just like writing poetry--you can't rebel if you don't know what you're up against.) Flaky, meaty goodness. Gone in 90 seconds, probably. Then we dinnered pretty quickly atop that, too. 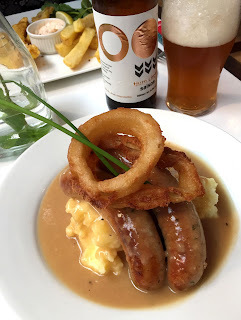 Our DK guide seemed high on The Market Bar in its pub section, so we went there, a very large space that likes its turn over--there's a limit to how long you can keep your table (it's reasonable, but still, it's like the meter's ticking). The draught list is big, but not necessarily in a great way--lots of what you might expect (Heineken and Heineken Light)--and it also featured a beer with a name that bugs me. Just like I find San Diego's Belching Beaver just too rude to reward with my business (whether the beer is good or not--c'mon guys, grow up and don't flatter the incels), Ireland has a brand called Cute Hoor. As in, "I'll have a Cute Hoor." Hahaha. Pass. Instead I went the bottled route. Tried to order a Third Circle Rye Stout, but they were out. 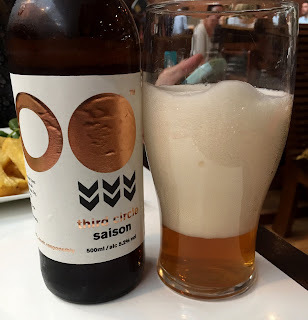 Luckily they did have the Third Circle Saison, which survived being agitated on the way to the table (I assume), as I ended up with a very heady pour. So Dublin itself can brew some fine craft beer. The saison was a mildly sour one as the style goes, but had some character and kick and a surprising amount of hops, too. For food we went about as traditional as we could for our last pub supper in Ireland. Chryss had the fish and chips; I had bangers and mash (and onion rings--we should have invited Paul, who actually was still in Sligo anyway). You know how food can satisfy but not intrigue? There you go. I have to admit what looked like too much gravy wasn't, but, of course...gravy. To be honest, it wasn't fair to drop this meal as a capstone on all the rest of our two weeks of eating, so much of it revelatory. Turns out you can go out with bangers and with a whimper. I'll show myself out...of the country...tomorrow. 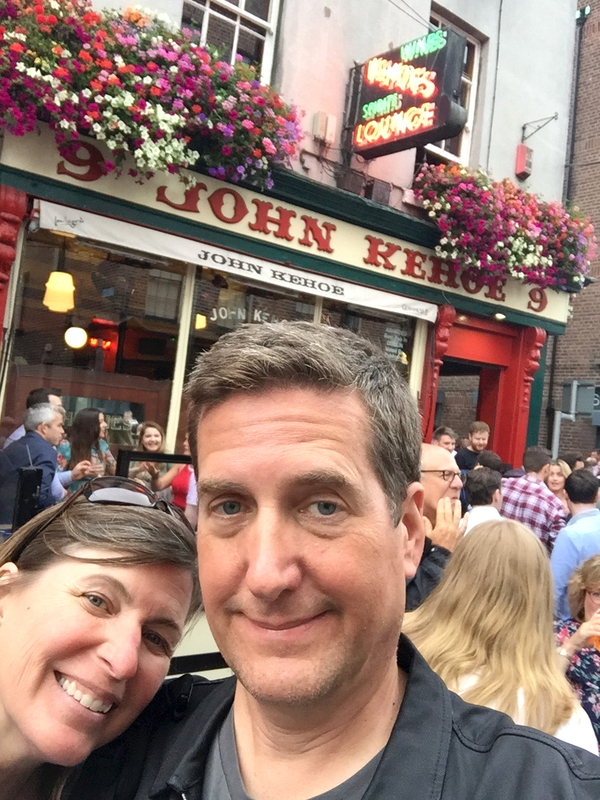 We did think about following that up with one last pint at a pub, but it was Friday and we were mostly in Temple Bar, but even south of that crowds were the norm. If you want to rob houses in Dublin, do it on Fridays from 5-7 pm, because everyone is at pub, and every pub takes over as much space on the sidewalk and sometimes street in front of it as it can. It's as if a liquor license covers any space that contains a drinker who could bump elbows with the next drinker, back to the bar itself, kind of like some ant colony a-swarming with a mighty thirst for stout and the weekend. While I refuse to judge, I also couldn't get up the energy to join the scrum, what with the impending weight of "early a.m. international flight" on my brow. I mean, I look sort of stupid silly here, don't I, and I've had all of one beer? Since we had the time to do it--the drive from Sligo to Dublin is two and a half hours--we headed back in to town before we left town, if for nothing else than to see it on a nicer day (cloudy, not drizzly). Poor Yeats, though, gets the bird drizzle. But that might just be what happens when you head out wearing your own words. 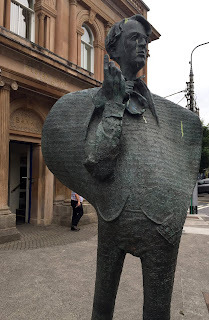 We also tried to check out spots with Yeats memorabilia, and while the Sligo Library and County Museum (note the telling order there, btw) is quaint, it offers things like a replica of Yeats' Nobel Prize. And no photos allowed. Then there's the Yeats Building Visitors Center, which seems tangentially associated as it's the home of the Yeats Society. When we were there summer school was in session so you couldn't get into most of the rooms, anyway. All that said, it's still a lovely town along the Garavogue, even without early evening lighting making it a pointillist's dream. 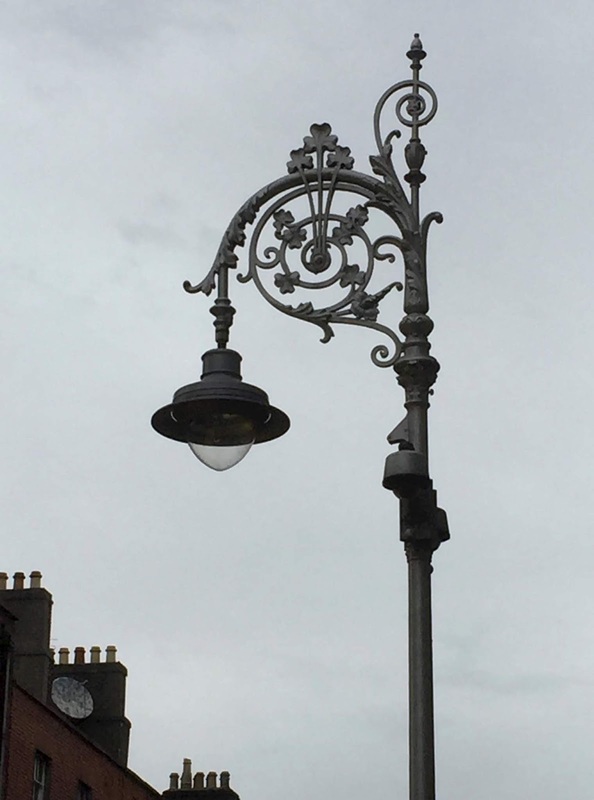 Speaking of lighting, how cool is this lamppost in Dublin? It's as if almost everything popped out of the Book of Kells, ornate as an illustrator's wildest dream. 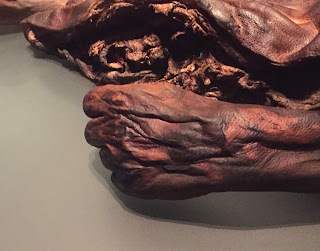 But when it comes to fascinating, it's hard to beat bog bodies form the Iron Age. 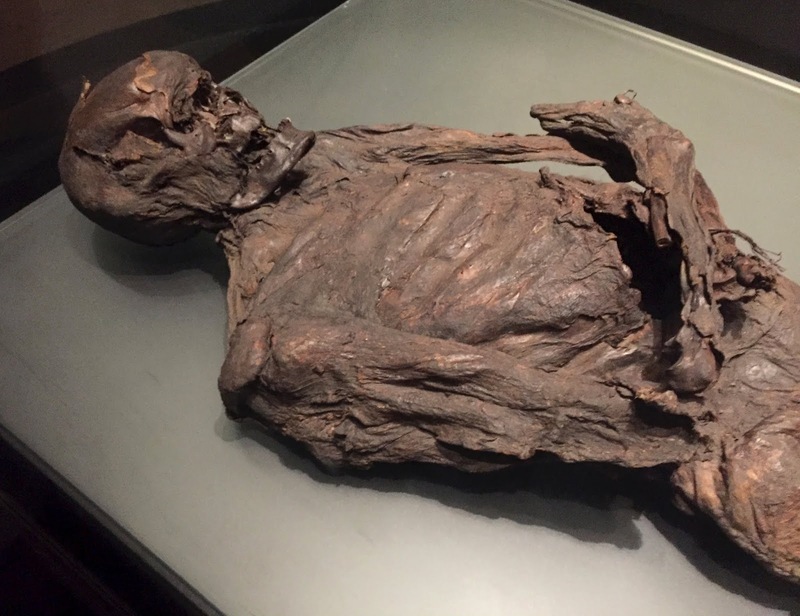 So yes, we visited the National Museum of Ireland, Archaeology, as it's not every day you get to see remains from 2000 BC. (Except, maybe, in the mirror the morning after a hard hard night before.) 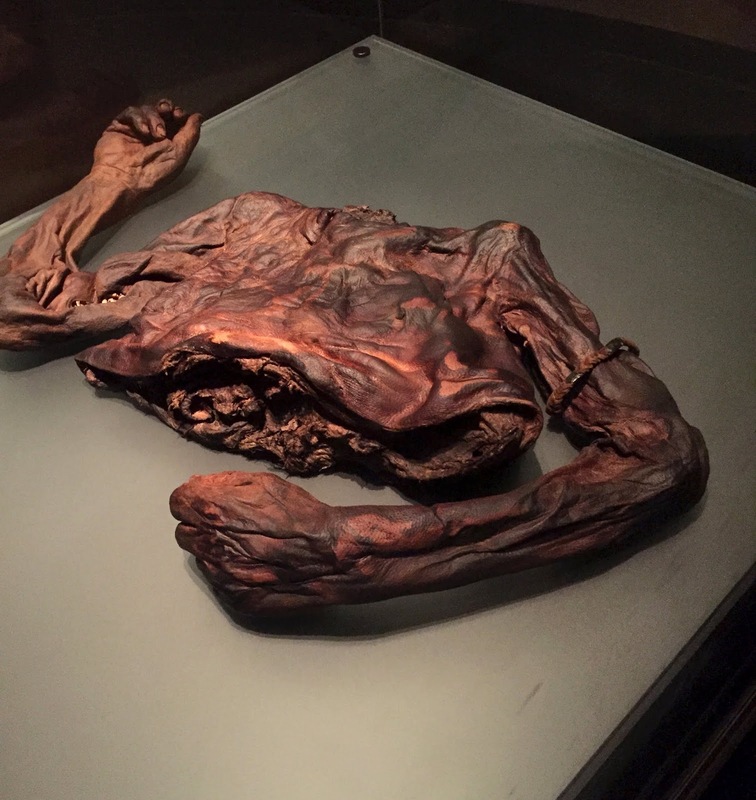 It's a bit tricky when you have to share your viewing with hordes of schoolchildren, who, it turns out, are just as rowdy and bored as American children, but if you wait the busy buggers out, you get to have a viewing with something as stunning as Old Croghan Man. That's a person. Think about that. How can you not think about that. That hand, if not for the coloring, could be anyone's, yours. Plus 40 centuries. If it moved you wouldn't jump; it's almost more shocking it doesn't. This one is a bit more skeleton in the closet. They think most of the bog people were sacrificed. We like murdering each other when we can pretend it means something. To finish, though, where else could we go on this trip of words but the National Library of Ireland? We didn't get into the great reading room, even, no matter how I adore those, cathedrals to books and the people who love them, each a priest for the religion of reading. Instead we explored the exhibit "Yeats: The Life and Works of William Butler Yeats," and ended up finding more than we ever dreamed even Sligo might offer. The NLI knows how to put on a show. Different aspects of Yeats' life and career each got its own nook, from Maud Gonne to Easter, 1916 to An Occult Marriage. That nook would be decorated to fit the theme, and include poems and letters and well-done videos we didn't have enough time to dive into. 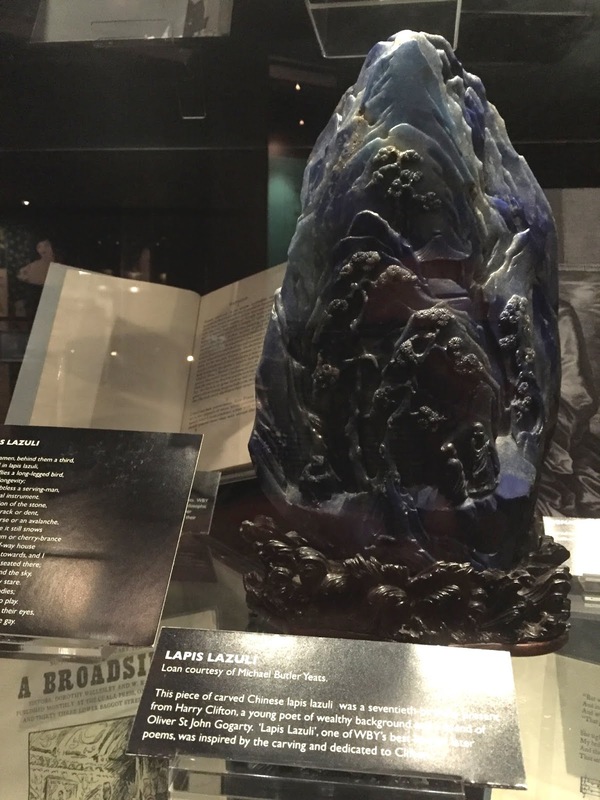 The poet, and the lapis, and the lore and lure of Ireland, they all ask us to delight to imagine. 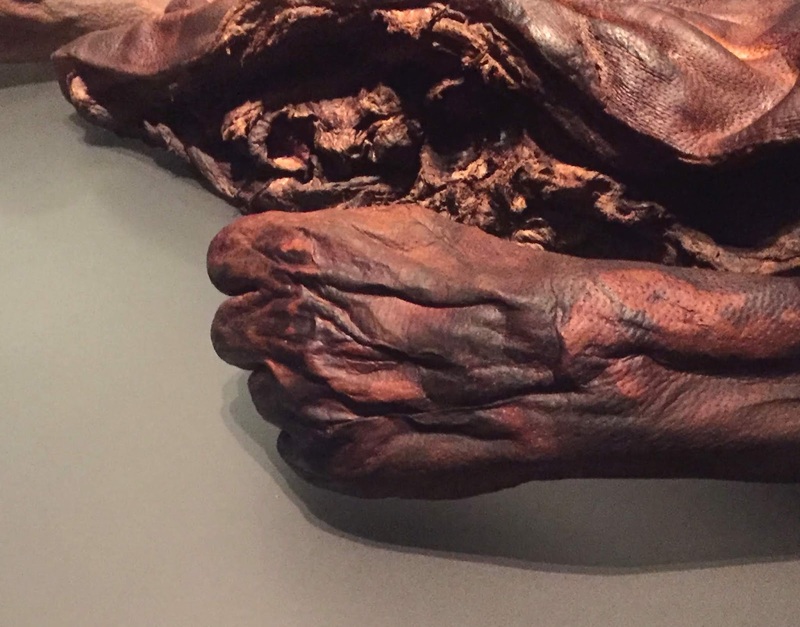 What lives as long as a the draw of a bog body's mystery? Mournful melodies ring exact rhymes with our glittering eyes. How much beauty we mine from the tragic scene. Go back to the post on Day 11 (Sligo).